Ever wonder how to make a realistic fused leaf element for your masterpiece? Frit castings are ok but they are thick and hard to incorporate in your fused landscape. We have found the solution to this quandary. We are introducing the new NatureScape MOLDS that are two sided, realistic, leaf molds that produce slumped glass leafs with texture on both sides of your glass. The bonus to this is that you can use one thickness of glass! NatureScape MOLDS are made of a durable metal that will endure multiple firings, rapid temperature changes and still look good as new for your next firing. If you happen to have glass stick to your mold, simply sandblast off the glass remnants and you are good as new. Coat the NatureScape Mold with an aerosol Boron Nitride, such as ZYP or Mo-Re. Water based mold release products, such as Primo Primer can be used on the molds if you preheat the mold to about 225 degrees. Apply the primer while the molds are hot to get a good bond. Now you are ready to begin! You can use your mold to trace around on your glass as a pattern. Cut your glass and place on the prepared mold. 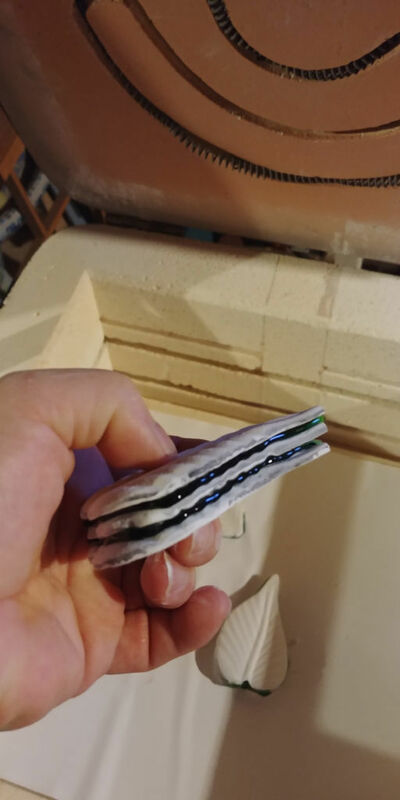 Here is the cool part, you can stack another mold on top of your glass, like a glass sandwich, and the weight of the top mold will force the glass into the bottom mold and create the details of the mold. If you feel brave, you can then cut another piece of glass and make a double stacked sandwich. Check out the pictures of the Leaf Sandwich, compliments of Jo Knehr. You may have to adjust your firing schedule slightly. It may be necessary to lower the temperature or shorten your hold time to prevent the leaf from thinning in spots. Thinning is more likely to happen on the heavier molds (LF 6, 8, & 9). You can paint your glass, use powders or frit to add life to your leaf. You can add stems of wire or thin glass to add more character. Only your imagination will hold you back. The Molds are very durable but must be kept in a dry location when you are finished firing. If you have surface issues with the molds, you can sandblast new life into your mold. For more information on our NatureScape Molds, check out our handy information sheet! Check out our complete line of NatureScape MOLDS and start having fun! Introducing the newest line of durable metal slumping molds called NatureScape MOLDS. They are two sided molds to give your slumped glass leaf design texture on both sides. Long lasting and easy to create unique glass leaf elements. Create inserts with leaf designs, using NatureScape Molds, that have a real 3 dimensional look! Simply lead or foil your panels into an unique stained glass window hanging. 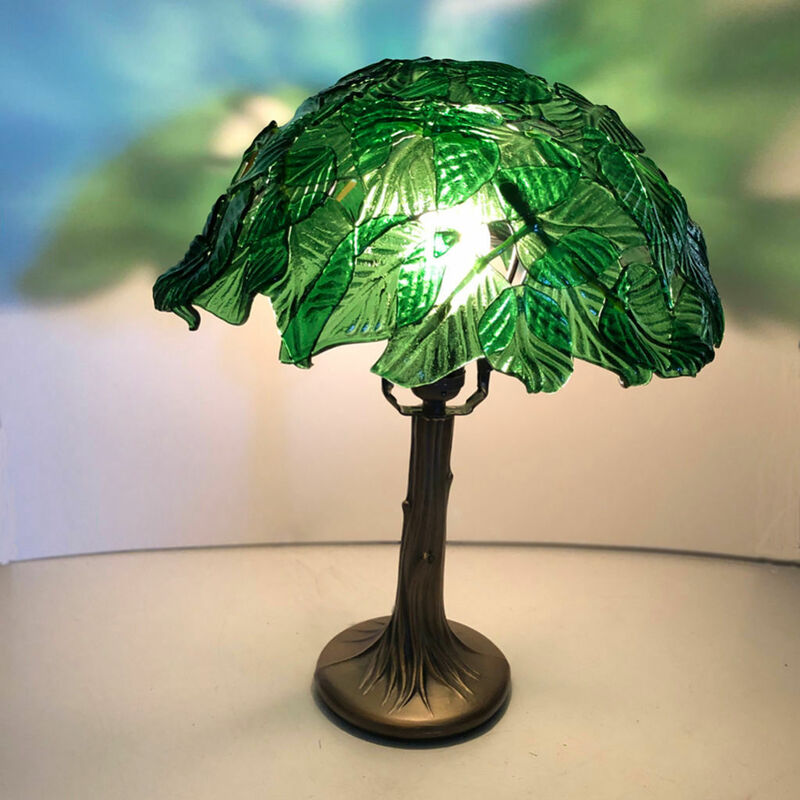 Create a one of a kind free form leaf lampshade using NatureScape MOLDS. Once you have made your two sided leaf elements, just fuse them flat and then slump them over a lamp mold. Create this two sided unique dish, using NatureScape MOLDS that has textures on both sides. Looking for a more organic look? Create your elements with NatureScape Molds and fuse them onto your Sushi Bowl. Step back in time with this Art Deco Lamp creation. The main focus of the fused design is a Deco design using NatureScape Molds. Fuse your center element first and tack fuse the element onto your full fused design.